behind mommy lines: Location, Location, Location! My kids are very schedule-oriented... perhaps I had a hand in this? I'd rather not dwell on how every little move I make shapes who they are on a daily basis... it's just so much PRESSURE. When the twins were tiny babies, I was told to talk to them during the day, making a narrative for them as we went about our activities. So I would go about chatting them up, things like, "We're going to go to Target again! For more diapers!" or "Let's all go upstairs and change your clothes again- they are dripping with spit up!" and "Mommy is going to fold yet another load of laundry! Wanna watch me from your swings?" It was like having my own reality TV show. Sometimes I would break out my Julia Child impersonations while whipping up enough homemade babyfood to feed a small village. I thought all this would help them with cognition and speech as their brains developed. And as they got older, talking about sequences of events would help prepare them for what we were going to do next- you know, trying to be a good mother! Well, all this has had a rather unfortunate side-effect; when I tuck them into bed (for naps or bedtime, to the twins it's the same thing, apparently) I get asked "But wait! What we do tomorrow?!" This is a question that MUST BE ANSWERED. Not only answered, but in a satisfactory manner. "I dunno! We'll see!" is grounds for feet kicking and refusal to accept sleep-time. I'm sure you can imagine the kind of mental stress this can place on my weary brain. I have to make "going to Target again" sound fun! and exciting! (they're big enough to know going out for things like deodorant and toothpaste does not make for a sporting good afternoon) Plus, there are times- lots of times- that I just plain don't know what we are doing the next day! Stuff! We'll do STUFF, guys! As if sensing my anxiety at the question, my smarty-pants four year olds have taken it upon themselves to come up with activities for the day. Yesterday I woke them from naps, excited to tell them I had planned a super fun trip to the nearest splash pad/park. I was rebuffed with silence, followed by: "No Mama, we needs to go swimming at Grandma's pool... with Grandma." Most of the time, the girls' solution for a "tomorrow" with nothing planned in advance is "playing squishies." I've been fine with that. They mess around with non-edible spaghetti, shape cutters, and rolling dough into snakes, I catch up on some reading... or television. 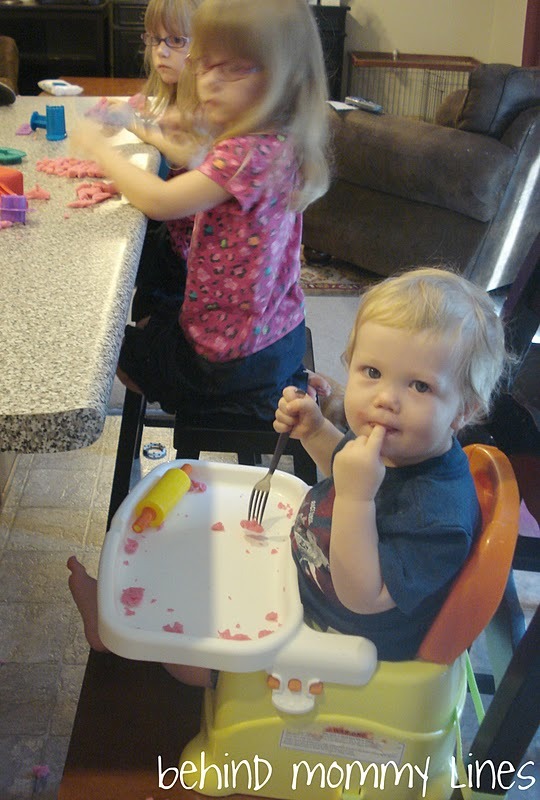 I tried giving him play-doh on his highchair tray. It lasted all of five seconds; Partially because our Play Doh is old and hard, it even gives me hand cramps from muscling it around. He mostly wanted me to sit right next to him and "help" him play with it. While I'm glad he did not try and eat it, I do not want to be so highly involved with what is supposed to be "mommy-free-quiet-play-time." It never ceases to amaze me- just how dedicated he is to being part of the big kid crowd. Moving him up two feet solves the whole problem. However, the issue of "what we do tomorrow, Mama?" is still in play. I often tell my girls what we're going to do after naps or the next day to encourage them to go to sleep. As in, "We are going to the park later, so you have to go take a good nap so you'll be ready to play!" I never imagined that it might eventually backfire into HAVING to have something on the agenda. I might cut back on that kind of talk!